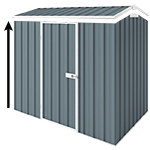 This Suncast Noble Horizontal Stow-Away Storage Shed measures 1.12m x 1.92m x 1.32m. This Stow-Away Noble Horizontal Storage Shed provides storage space for your garden tools used to maintain your backyard. It has a beautiful modern design and is lightweight making it easy to change position and it is very easy to assemble without professional assistance.